The Door’s Career and Education programs are central to our comprehensive, integrated model. One of our most successful programs is This Way Ahead, which was launched twelve years ago in partnership with Gap, Inc.
It’s designed to provide teens and young adults with invaluable, hands-on experience in the workforce, often for the first time. Participants gain essential and transferable job skills, as well as in-depth knowledge of the retail industry. Interns receive ongoing mentoring and supervision from store managers who have participated in related training. Participants are also encouraged to take advantage of The Door’s entire suite of support services to address any barriers they may face so that they remain engaged in their internship. Our unique model ensures that anything a young person needs is available at The Door, from academic tutoring, to help applying to college, to healthcare. Today, our close and extremely productive partnership with Gap Inc. has resulted in a scalable model that has expanded to 32 additional U.S. cities. 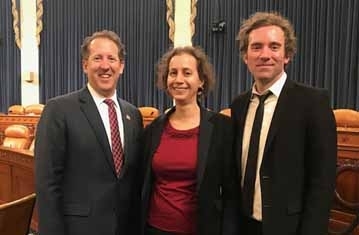 On April 25, Julie Shapiro, the Executive Director of The Door, had the honor to join David Ard, Senior Vice President and Global Head of People and Communications for Gap Inc., as they both testified at a hearing in front of the House of Representatives Ways and Means Subcommittee on Human Resources. The subject of the hearing was “Jobs and Opportunity: Employer Perspectives on the Jobs Gap”. As Julie said in her testimony, “As far as we know, this is the largest employer-led internship initiative in the entire country.” And most importantly, almost three quarters of the internships are converting to jobs. Executive Director, The Door – A Center of Alternatives, Inc.
Chairman Smith, Ranking Member Davis, and members of the subcommittee, I am honored to be with you today at this important hearing on jobs and opportunities. My name is Julie Shapiro and I am the Executive Director of The Door in New York City. For over 45 years, The Door has served as a vital resource for New York City’s young people, including those facing homelessness, unemployment, poverty, and deportation. The Door’s mission has always been to empower young people to reach their potential by providing comprehensive youth programs in a diverse and caring environment. Each year, The Door works with nearly 10,000 young New Yorkers, ages 12-24. We offercomprehensive, integrated programs free of charge, confidentially, and all under one roof. They include: primary and behavioral health care; education, career training and internships; creative arts programs; healthy meals and nutrition counseling; legal and immigration services; and supportive housing. The Door provides career and education services to 3,400 young people annually, 1,200 of whom are disconnected youth. We know that for many low-income young adults, three intertwined challenges impact their ability to gain a foothold in the labor market. They are 1), minimal educational attainment and basic skills; 2), limited job opportunities; and 3) limited access to living wage career paths. The retail industry, our nation’s largest employer, provides genuine opportunities to address these challenges, due to a willingness to hire young adults, low entry-level skill requirements, anticipated growth, and advancement opportunities. Part-time retail jobs provide flexibility to meet competing needs for immediate work and continued education, and these jobs build skills valued throughout the labor market. For more than 15 years, The Door has been committed to tapping into the retail sector. Our long‐standing employer/nonprofit partnership with Gap Inc has been the cornerstone of our pioneering retail sector training programs. We have been working together and building a team that finds solutions that work for Gap and for young people – from the development and first pilot site of This Way Ahead in 2007, with 11 interns. This year – 11 years later – we are preparing to place 414 youth in internships across more than 60 stores in New York City and Westchester County. In 2019, we anticipate growing the program to 500 interns. As far as we know, this is the largest employer-led internship initiative in the entire country. This Way Ahead internships are designed to provide youth with invaluable, hands-on experience in the workforce, often for the first time. Participants gain essential and transferable job skills, as well as in-depth knowledge of the retail industry. Interns receive ongoing mentoring and supervision from store managers who have participated in related training. Participants are also encouraged to take advantage of The Door’s entire suite of support services to address any barriers they may face so that they remain engaged in their internship. Our unique model ensures that anything a young person needs is available at The Door, from academic tutoring, to help applying to college, to healthcare. This Way Ahead is a model of how companies and nonprofit organizations can collaborate to make an impact on the lives of thousands of disconnected youth. Many companies want to do the right thing and hire young people in the community. Our partnership with Gap Inc. shows this can be brought to scale, but only if there is a strong partnership with an experienced youth development organization. I am grateful to Gap Inc. for their outstanding leadership and partnership, and I encourage the Subcommittee to look at ways to develop and fund programs like This Way Ahead.